Trix E. Lom is no stranger to covering Miss Debbie in teh courthouse: her earlier dispatches covered Frisch's first sentencing on 3/12/09, and her 10/25/10 conviction on a probation-violation. It was a typical day in Lane County court as your intrepid reporter arrived. Once again, I removed my belt and boots then redressed in the small area behind the security station next to the slowest elevator in Lane County. A skinny young woman bemoaned her ongoing drug problems and approached the counter on the second floor to renew a restraining order against her husband. On the third floor, a young man discussed his divorce case with his sympathetic mother. I had spotted Deb Frisch as soon as I approached court room 302, sitting just outside the door with her female attorney. I walked past and sat down on a nearby bench, overhearing snatches of their conversation about religion and family. "We'll get this done," the lawyer reassured Frisch confidently. By 9 o'clock Frisch was still waiting outside the courtroom door, but two minutes later she was inside, so I entered the court room and took a seat in the back row, on the left. Five other people were in the visitor's gallery -- a man and two women directly across from me in the back row on the right side of the aisle, and Frisch with her lawyer seated on the bench in front of them. How she must be suffering, I thought, as the three in the back row loudly discussed their amazing iPads and compared them to the Blackberry--toys now forbidden to Miss Debbie as part of her probation--which one woman claimed she would "never give up!" Frisch and her lawyer quietly left the room. A minute or two later they returned. "We can go right up," said Frisch's lawyer, motioning to the table for the defense. Almost immediately the clerk ordered "All rise," and informed us the Honorable Bryan T. Hodges was presiding. The only case to be heard was STATE VS DEBORAH ELLEN FRISCH. Miss Debbie's lawyer told the judge she believed the prosecution would read the terms of their agreement. not go online "or on the internet"
have no contact with her latest victim or his family (with "contact" meaning its legal definition). Judge Hodges asked Frisch whether she'd heard and understood the prosecution. She stood up hurriedly and answered "Yes," in a clear voice. Frisch's curly, reddish hair is long, just past her shoulders, and she's very thin. But, so far that morning, Miss Debbie's face had lost its crazed, concentrated tightness and her eyes, while clear, were less hawkish, less sharply focused in her past intimidating fashion. She was dressed casually, Eugene-style, in a pair of faded jeans and a buttoned-down work shirt. She sat down almost as quickly as she'd stood, and her lawyer entered her plea of guilty on both counts, the first of which is harassment. Judge Hodges asked whether the defendant had been fully advised of her rights. Yes, her lawyer answered, both in writing and in person. The judge turned to the prosecutor for the state, and asked what they could prove. The prosecutor answered confidently the state could prove that on October 14th, 2010 in Lane County the defendant intentionally harassed and insulted the victim with abusive words and gestures intended to provoke violence. Then on October 17, 2010, with intent to facilitate unlawful activity, the defendant impersonated S.H., Lane County's Public Health Director at the time--a government official--in an email. "The state can prove this," declared the prosecutor. VICTIM STANDS UP TO BULLY FRISCHJudge Hodges turned to Frisch's lawyer and asked whether she would like to take advantage of the two-day delay before sentencing. She declined. The judge was then informed that Debbie's latest victim wanted to address the court. Teh Victim was invited to stand up where he was and to give and spell out his name. He began his statement by introducing himself as a "local budding politician." The judge made some wisecrack about that which your reporter failed to hear (Judge Hodges is an older gentlemen who speaks with authority, but quietly). Proving his diplomacy, Teh Victim glossed over the wisecrack with an indulgent laugh and continued without skipping a beat in his concise yet unhurried cadence. He told the court he is running for the 4J School Board now but on the day in question he was standing at 7th and Pearl in Eugene with a campaign sign because he was running for State Representative of District 13. His daughters were with him and having a great time. "I go to lots of meetings," he confessed, and that day he was spending time with his daughters. Then Deborah Frisch drove up and began shouting "sexually explicit expletives" at him. Teh Victim, while visibly angry, maintained his cool throughout his statement. He described what transpired as well as any civic-minded and well-spoken person could, without uttering a single profanity. He said he could not explain why this bizarre event was happening, but as Frisch walked by him she continued her verbal assault. He knelt down and pulled his daughters to him, trying to cover their ears and to shield them. The situation was "beyond belief," he testified. It was a "mind-blowing public attack," he continued, one he would have to explain later to his daughters. But the abuse did not end there. Frisch later bashed him and family members on her blog. At this point, Mr. Callahan's voice grew stronger, fraught with emotion. His anger was palpable, and although he kept his cool, he spoke sharply and a bit louder as he declared "That's where I draw the line." He backtracked a bit, saying he draws the line at anyone harming or threatening his kids but "As a victim . . . " he began, then stopped as if to gather his thoughts. He said he doesn't like calling himself a victim, but in this case he is one, and ended his statement by recommending "the harshest punishment" for Frisch's crimes. After a beat, he said "Thank you" and sat down. Judge Hodges thanked Mr. Callahan and turned again to the defense. Frisch's lawyer began her plea by stating her client is unemployed and fifty years old. She's seeking medical help for some "issues" she's dealing with, and she's supported by her family, who are "very involved" in her life. Teh law office, said teh attorney, has received many calls from them. They want to make sure she gets the care she needs. Frisch's lawyer was appointed to represent her, she continued, and the charge is a misdemeanor. She asked the judge to impose no fines, fees, or costs. She claimed Frisch's probation officer had written a generous letter which states her client is "doing excellent," and that in her case he has waived his usual fees. In conclusion, Frisch's lawyer told Judge Hodges her client relies solely on her parents for financial support and lives well below the poverty level--facts well-known to loyal Daily Squeak readers. She wanted to make the judge aware of Frisch's financial condition. At that point, the judge allowed Frisch to speak. She stood up and chimed in a high, childish voice, "I just want to apologize for all the horrible decisions I've made." Judge Hodges then addressed Teh Victim at the back of the court with another apology. "This may seem strange to you," said teh Judge. "It used to be strange to me." He then explained that plea-bargain procedures are necessary in a court of a dozen and a half judges with thousands of cases before them. These circumstances require accommodations, he said. Frisch's lawyer, standing next to her client, whispered something in her ear. It was clear to all present that Teh Victim's earnest plea for harsh punishment would be denied. The judge agreed to follow what the two competing sides had worked out and invited Teh Victim to discuss the case with him later if he so chose. 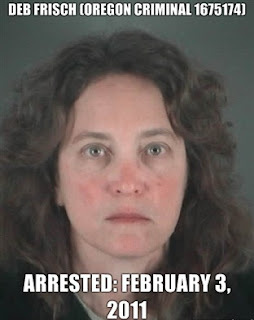 Thirty-six months of probation during which Frisch will violate no law (Editor's Note: This appears to be concurrent with Miss Debbie's current probation-term, which runs through 11 March 2014, according to Criminal Debbie's online VINE record.) If she is cited or arrested for any offense, even a violation, she must report it to the court in writing. She must also report any change of name or address within five days and continue her supervised, formal probation. Miss Debbie is forbidden from contact with her victim or his family or to be in or near their residence. That is a "total, absolute prohibition," stated the judge. If Frisch does contact or attempt to contact Teh Victim, he'll notify the District Attorney and, he told her, "You will be arrested, brought to court, and might go to jail." Frisch's probation officer has the authority to search her computer at his initiative at any time. The judge asked the state whether there were any oversights in his sentencing to which she answered, "I don't believe so," and Frisch's lawyer concurred, but the judge didn't acknowledge her with so much as a glance. Judge Hodges told Frisch if she wishes to appeal this decision she must do so with the appeals court in Salem within thirty days. That was the end of her formal sentencing, but Teh Judge had a few more words to say. "This is a sentence based upon negotiations," he declared, but if there is a violation "all bets are off!" And, rather than hedge as before when he said she "might" go to jail, he issued this clear warning: if Frisch violates her probation, she'll get "maximum jail time." Before the judge rose to leave the courtroom, he thanked Teh Victim again. Outside the courtroom, I lingered to chat with an older woman about her son's messy divorce. Then Deb Frisch suddenly stormed out the door. She arrowed toward us, stalking fast, and I saw her eyes had hardened again. She'd regained the sharp, hawkish gaze meant to scare all the demons her paranoia tells her are out to get her and to intimidate her victims. No, this reporter thought, she hasn't changed. Her behavior inside the courthouse was just another of her acts and, sadly, I must predict this drama isn't over yet. On Jan 22nd, Miss Debbie was spotted stalking teh Oregon Ducks' "Celebrating Champions" parade. On Feb 2nd, Miss Debbie spewed bile at a Eugene City Council Meeting. As I walked slowly away from the courthouse under an overcast sky, I saw Teh Victim stuffing campaign signs into his trunk. I approached him and congratulated him on his performance in the court. He thanked me. I expressed my condolences that he'd been attacked by Frisch, with no prior warning and no way to explain or justify such random and vicious criminal behavior. Teh Victim was stalwart and affable, gave me a business card, and showed me photos of his beautiful children. I wished him luck in his campaign. This reporter fervently hopes Frisch has no further victims. Of course, this is not the end of the story. Wherever and whenever Frisch turns up again, Teh Daily Squeak will be here with another timely report. Once again, thanks for providing courtroom coverage. All the time and effort you put in (schlepping to teh court, sitting through the proceedings while keenly observing them, typing out your account, etc.) is most appreciated.